eye gaze system from a field of two and consistently chose the item on the left. He did somewhat better if you arranged his two choices vertically, but not much. Fast forward five years. He is now using a speech generating device with 25 buttons per page. He can hit the smallest targets I have ever seen on his device, buttons only centimeters in size. Why can he communicate via eye gaze on an eye tracking device and not using low tech? Who knows? It could be that having a person in his space to hold up his choices distracted him. It could be that he was bored with the two choices he was being given. It could be that two choices being held up in space did not have a clear enough figure ground for him to visually distinguish them. It could be because secretly he was saying, "I hate you and your two ridiculous choice cards!" I honestly don't know why he cannot respond accurately to low technology eye gaze choices yet he can communicate on a high technology system. More over I am not sure it matters. What matters is that his TEAM at the time, especially his parents and his augmentative and alternative communication specialist decided to try high technology eye gaze anyway. And thank heavens they did! AAC through high technology eye gaze changed his whole world. Access to augmentative and alternative communication is not a hierarchy, though so many of us in the field want it to be. We want to believe our students will work from using objects to photographs to picture symbols. We want to believe we start with two choices and move to four and then eight and then sixteen before we try dynamic display. We desperately want to believe less is more with emergent communicators. The problem is what if we are wrong? What if our stubbornness leads to us creating individuals who cannot communicate, not because of their disabilities, but because we never let them! Because we never gave them the correct tools for them? Living the least dangerous assumption means that we don't restrict our learners because of our own belief systems. We assume that they can. We presume competence. 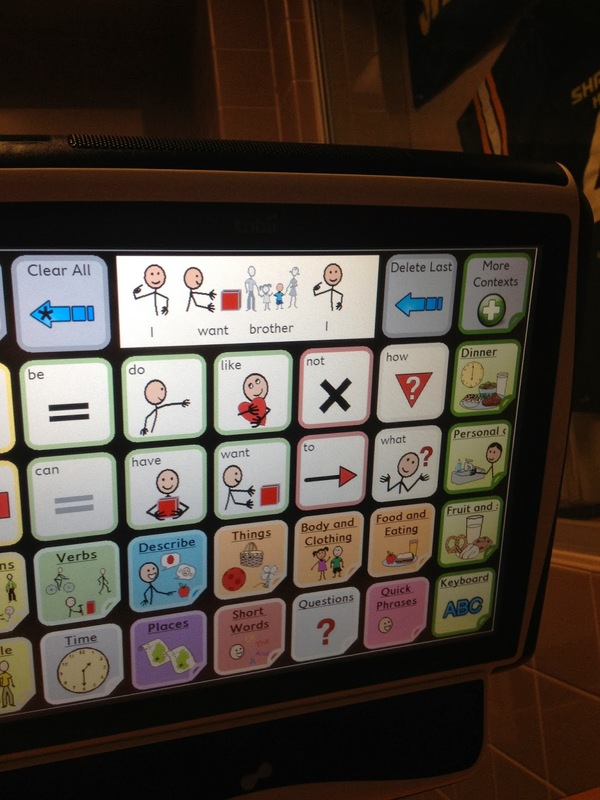 Using a hierarchical system of AAC is not living the least dangerous assumption. It, instead, is making a very dangerous assumption. It is assuming that the child in front of you is going to use a prescribed series of steps with mastery at each step sequentially to learn to communicate. (Which, I should note, is NOT how typical communicators develop!) 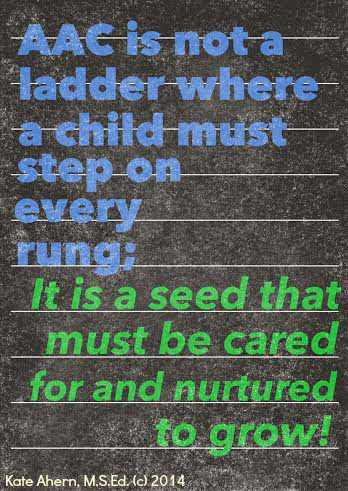 It also assumes that if the child cannot master a certain step then they cannot go beyond it - EVER. Additionally it assumes that low technology communication skills are transferable to high technology communication - which is not always the case. Using partner assisted auditory or visual scanning is NOT the same thing as using auditory or visual scanning with a switch. Using PECS or pointing to pictures or using a "Go Talk" is NOT the same as using a conductive touch screen with dynamic display. Using eye gaze to look at objects or photos or picture symbols is NOT the same as using an eye tracking computer system. Just because a student can do one does not mean they can do the other and just because a student cannot do one does not mean they cannot do the other! This hierarchy is our construction as professionals and sometimes it is right. The worry is that sometimes it is very wrong! We have so many more tools now that we did when I started in this field. We have so much more research. 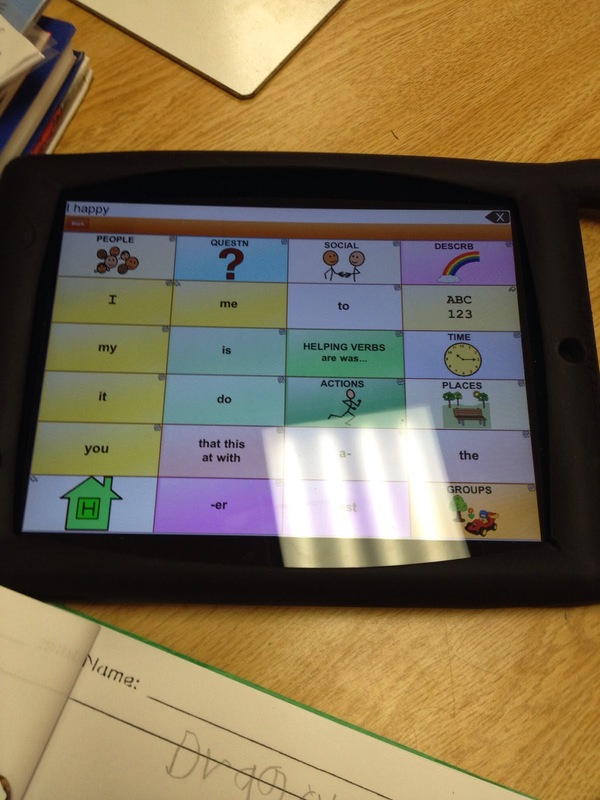 We have research that says that just one or three weeks of intensive aided language stimulation generally increases AAC skills (and we get to have 22 weeks with our students! Why aren't we embracing this?). Yet we still "drill and kill" with field of two choices for beginning communicators. There are, of course, many things low tech can do that high tech can't as well, but since I have never, ever heard anyone argue that all AAC users should "prove themselves" on high tech first I am not going to enumerate them here! Long story short it is time for a new paradigm. It is time to scrap the hierarchy that is so pervasive in AAC. It is time to BELIEVE in our students. It is time to give them a chance. It is time to allow them a chance to try, really try, high technology AAC even if they haven't "proven themselves" with low technology first! Years ago one of my responsibilities was to help train new paraprofessionals to work in special needs classrooms. One of the things I would stress was that the way we teach any skill is to instruct, model, practice, praise. It's so simple really. How does anyone learn anything? There is some kind of instruction - usually a person acting as a teacher explaining to the learner. Then the teacher shows the learner how to do the new things. Next the learner tries it themselves, practices, the new skill. Finally the teacher praises what worked in practice and begins again with instructing and modeling what didn't work. It is such a natural process we don't think about about it. I wonder, however, why when we are teaching learners with significant special needs we forget that this is how to teach a new skill? Especially when it comes to augmentative and alternative communication! We often don't instruct much at all and we rarely model. We skip straight to the practice and sometimes we even turn the practice into testing. Testing has no part in learning. Testing, if it happens at all, is for after we teach a new skill; after we have instructed, modeled, practiced and praised. Yet we have all seen this and some of us have done it - the endless testing by drilling the student or asking them to do a task before we explained or showed them how to do it. I am not sure why we do this. Maybe it is the never ending drive to collect data at any cost? Maybe it is the crunch for time that happens with feeding and ADLs and everything else that needs to happen? Maybe we have simply lost touch with the way that teaching looks? Worse yet some teachers blame the student for failing to learn when they never actually instructed or modeled. They say the student is "too low". They say the student "isn't ready". They say the student "hasn't met mastery". How can this be if the teacher hasn't taught? What would it be like in our classrooms if we looked at each task our students are asked to learn and then used this natural way of teaching a skill? What if we tossed aside our "ask, ask, ask" mentality (which is really testing) and turned to teaching? What can you do to return to teaching by using the steps of instruct, model, practice and praise?